Rich Tander of CSN Mid-Atlantic speculates that Redskins tight end Jeremy Sprinkle is no lock to make the team’s final roster. Even though Sprinkle was a fifth-round pick, Washington would probably have to keep four tight ends for him to be one of the final 53. He currently sits behind Jordan Reed, Vernon Davis, and Niles Paul on the depth chart. 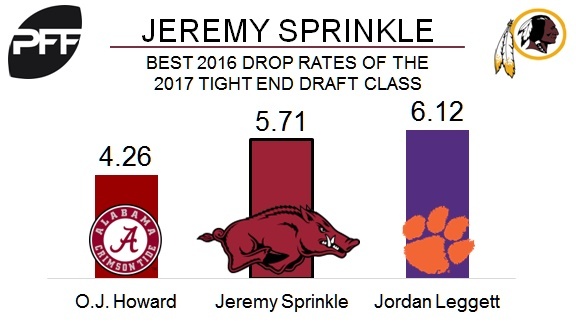 Sprinkle had the second-best 2016 drop rate of all tight ends drafted in 2017 at 5.71, behind only O.J. Howard. He was targeted 54 times in 2016, and dropped only two of 35 catchable passes. Of the 23 college tight ends that were targeted at least 50 times in 2016, Sprinkle had the lowest yards per route run at 1.16. His overall PFF grade of 72.1 ranked 43rd out of 199 qualifying tight ends.